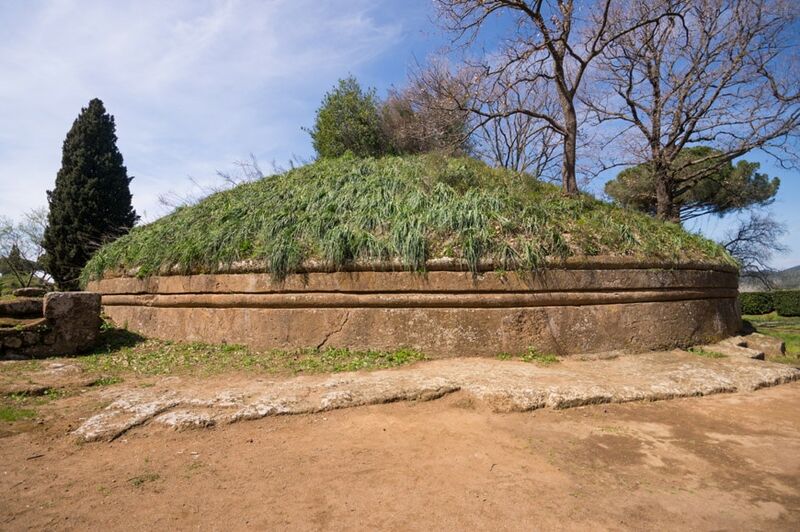 The necropolis “Banditaccia” in Cerveteri, near Rome, is an UNESCO World Heritage Site and the world’s largest Etruscan archaeological site. 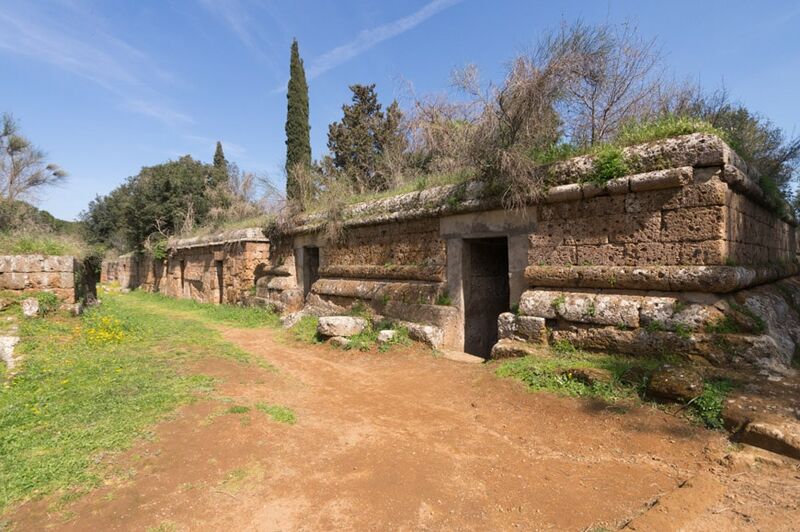 The necropolis is located about one mile / two kilometers from the historical center of Cerveteri, a small town about 25 miles (40 kilometers) north-west of Rome once known with the Latin name of Caere. The place, part of the Metropolitan City of Rome, can be reached by car or by bus from central Rome in about an hour. 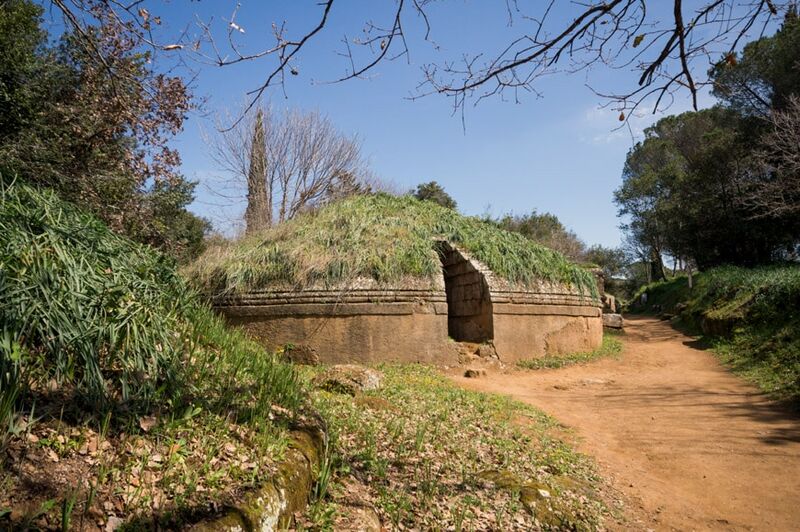 The archaeological site of Cerveteri encompasses an area of about 990 acres (400 hectares), 25 of which are open to the public. The first archaeological excavations were made by Raniero Mengarelli in 1909. 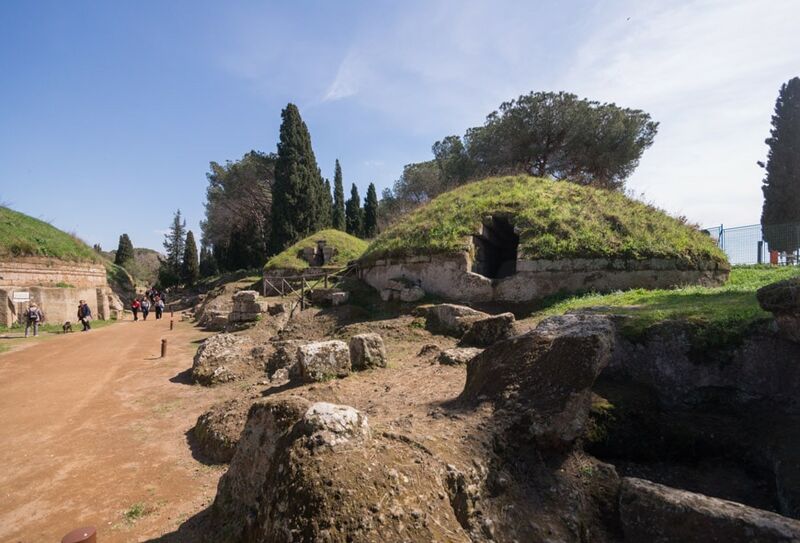 Overall, the necropolis comprises several thousand of tombs dating from the 9th to the 3rd century BC, surrounded by a beautiful natural scenery with cypresses and imposing stone pines. 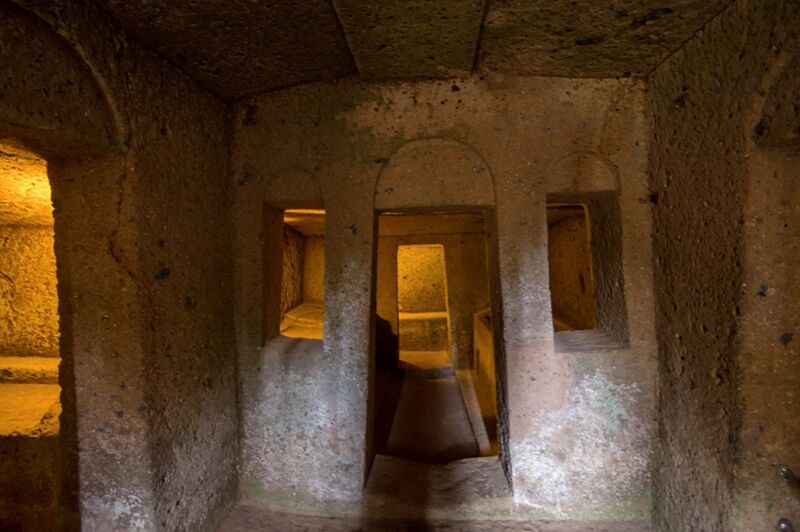 Differently from the necropolis of Tarquinia nearby, only few burial chambers are decorated with wall carvings and paintings; what makes the Banditaccia truly exceptional is the imposing architecture of its tombs, instead. 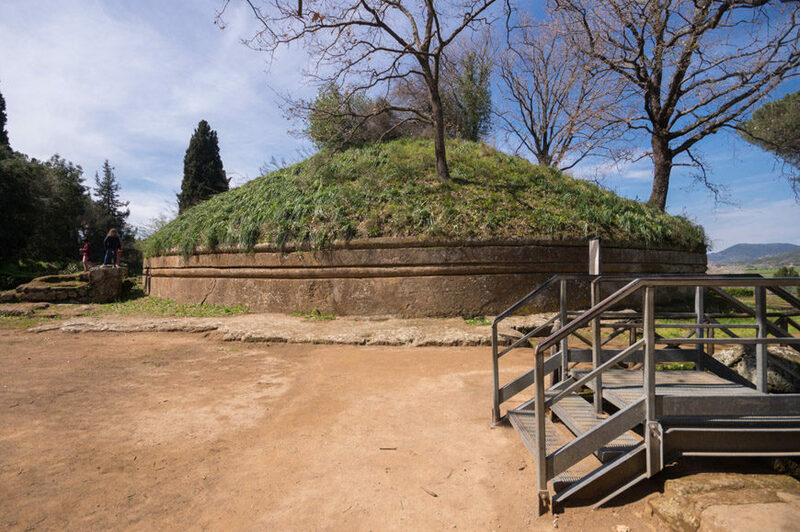 Furthermore, since its sepulchers accurately reproduced the Etruscan houses of the time (sometimes even with their furniture and home accessories), the necropolis casts a light on the everyday life and habits of an ancient mysterious people as the Etruscans. The area open to the public features some hundreds of tombs of three different typologies. The largest ones are monumental burial mounds or tumuli, up to 108 feet (33 meters) across, consisting of a circular external wall made of tuff rock blocks topped by a grass-covered dome. 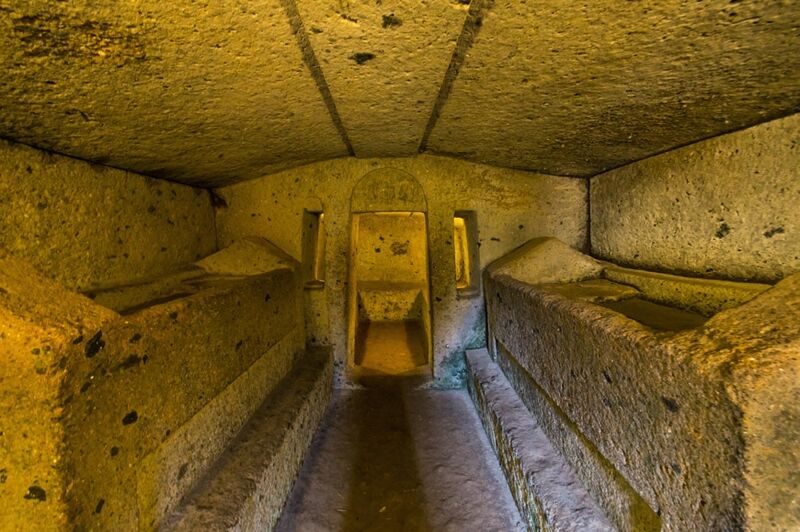 Internally, those tombs reproduce a typical Etruscan house with corridors and rooms (actually burial chambers) containing the stone shelves on which the sarcophagi once rested. 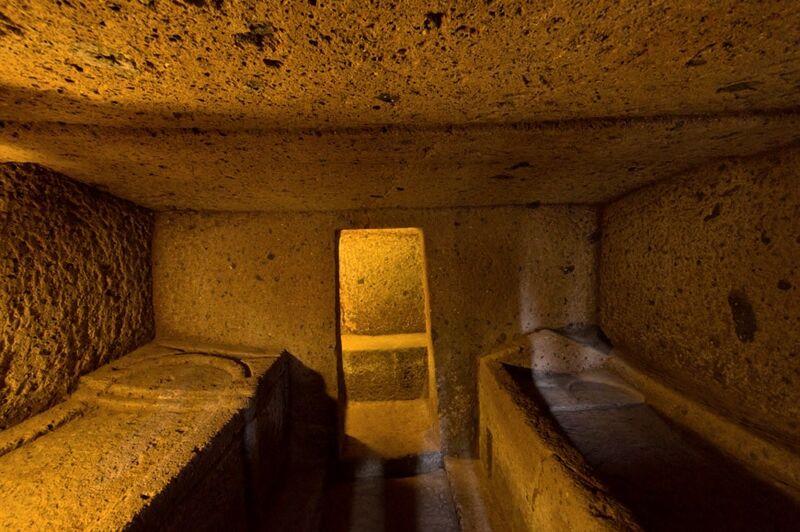 A second type, dating from the 7th to the 6th century BC, comprises more simple rectangular tombs, also called Cube Tombs, aligned along “streets” like small houses to resemble a sort of “city of the dead”. 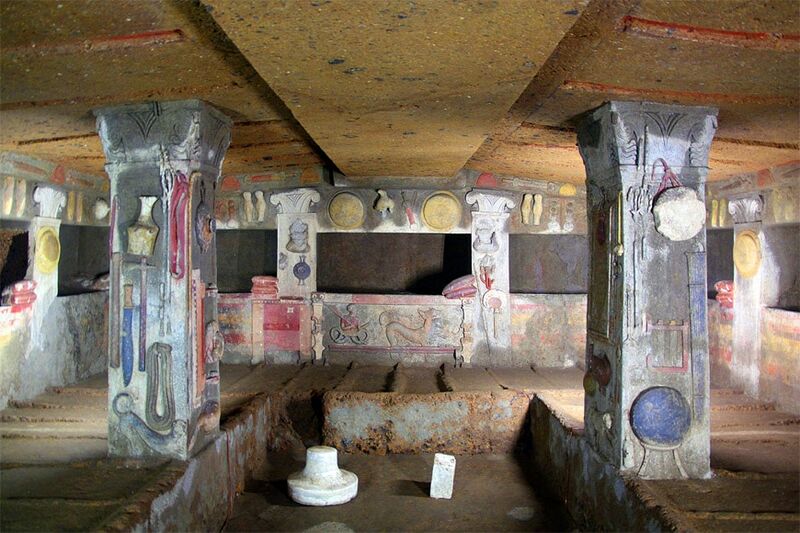 Finally, the more recent model consists of underground burial chambers carved into the bedrock, the most famous example of this type is the Tomb of the Reliefs, one of the few tombs in Cerveteri richly decorated with wall paintings and stucco reliefs. 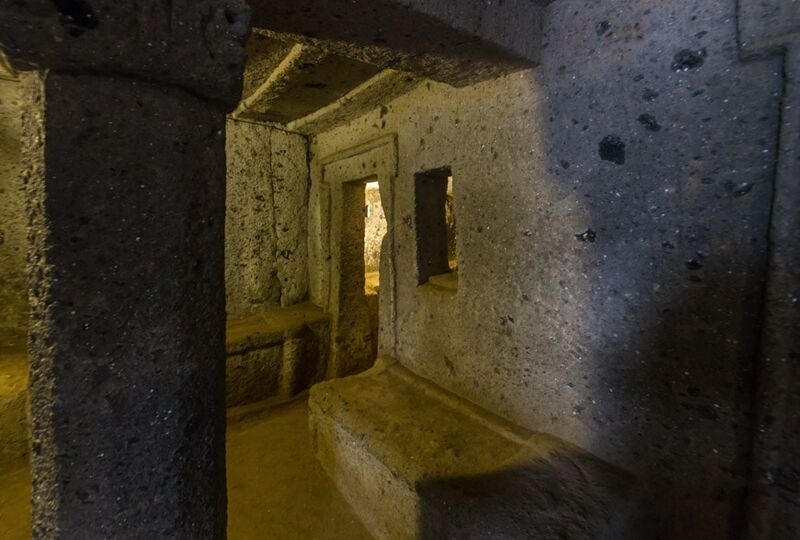 Some tombs (currently eight) also feature multi-language multimedia installations, which illustrate their history and most important characteristics, that can be activated with portable remote controls available for free at the archaeological site’s ticket desk. Originally, all tombs contained various artifacts, including vases in metal and ceramic, arms, jewels, statuettes, and everyday objects both of local and Greek origin. 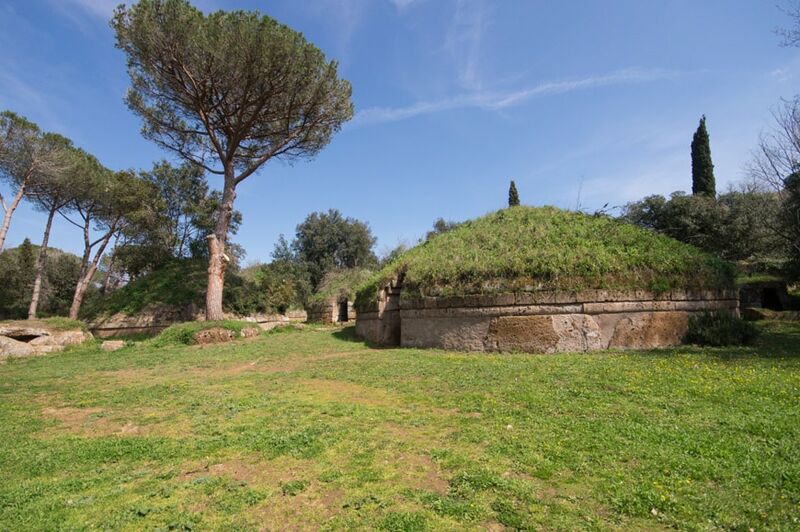 Some of those pieces are on show in a small archaeological museum (the Museo Nazionale Cerite) housed in the Ruspoli Castle located in the historical center of Cerveteri, while most of them are displayed in the Villa Giulia National Etruscan Museum in Rome. 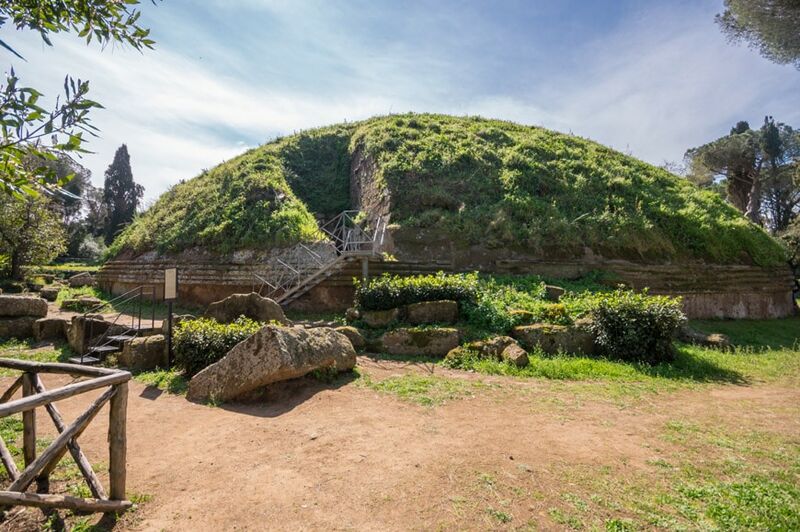 A complete visit to the necropolis of Cerveteri requires at least two hours, wearing comfortable clothes and shoes is recommended. The program of activities includes guided tours, educational activities, and workshops. The site also features a small bookshop and a rather inexpensive cafe-restaurant with outdoor terrace.